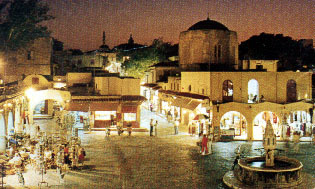 History of the city of Rhodes, Greece Hotels, Greek Islands. The combination of historical sites belonging to all epochs, 49 picturesque villages and infinitely varied and beautiful scenery could not be surpassed within such narrow limits. Exceptional fertility has earned it the name Isle of Roses, and it matters little if these are the conventional roses or the rose laurier (oleander), whose pink and white profusion rivals the deep red of the hibiscus and the heliotrope of the bougainvillea. According to legend Rhodes was a lovely nymph, loved by the sun god Helios, who later became identified with Apollo. Their sons Ialysos, Kamiros and Lindos founded the three towns named after them, which were united in 408 B.C. 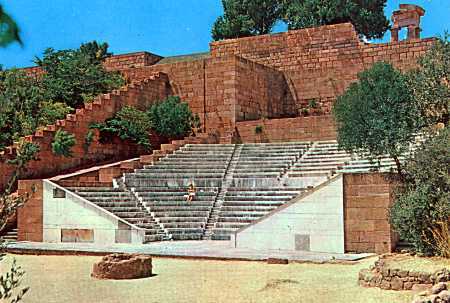 to build a new town on the northeast promontory according to the plans of the famous architect Hippodamos. 15 km-long walls protected some 100,000 inhabitants in Hellenistic times, wide avenues lined with 3,000 statues led to five ports, the largest of which was straddled by the Colossus, one of the Seven Wonders of Antiquity. From 290-227 B.C. the 31m-high bronze statue of Helios-Apollo, the master work of Chares of Lindos, commemorated the successful resistance against King Demetrius the Poliorcetes (Besieger of Towns). A devastating earthquake felled Colossus, a Delphic oracle pronounced against its reerection, and in 654 the Saracen pirates broke up the enormous figure and shipped the fragments as scrap metal to Syria. But the Colossus was only the most famous work of the distinguished Rhodian School of Sculpture characterised by a tendency towards the colossal. The main representatives were Timochares, who carved the bas-relief in the rocks at Lindos, Philiskos, who executed the group of nine muses transferred to Rome, Apollonius and Tauriscus, who sculpted the Farnese Bull now in Naples, while Athenodorus, Agisandrus and Polydorus collaborated on the deeply moving Laocoon now in the Vatican Museum. But all were overshadowed by the founder of the School, Lysippus, the court artist of Alexander the Great, with his superb Quadriga of the sun god. No less appreciated was the contemporary painter Protogenes for his symbolical picture of Ialysos. Though rapidly rebuilt thanks to the contributions of Hellenic sovereigns, creative art together with political and commercial eminence never again reached the heights achieved before the terrible calamity of 227 B.C.. Instead Rhodes became a major university town and after incorporation into the Roman Empire attracted the scions of the noblest families, among them Tiberius Gracchus, Scipio Africanus, Julius Caesar and Mark Anthony, to its illustrious Philosophy, Rhetoric and Law Schools. Despite repeated Saracen invasions Richard Coeur de Lion still declared himself in 1191 astonished at the splendid remains of mighty works of art. The Genoese admiral of the Byzantine fleet, Vignolo de Vignoli, was enfiefed with several islands for his services to the Empire. In 1306 he sold Rhodes to the Military Order of Saint John of Jerusalem, temporarily installed on Cyprus after its expulsion from the Holy Land. But the Emperor Andronicus II objected and only after four years of fighting were the Knights allowed to take possession of the island, eventually extending their dominion over most of the Dodecanese. The Order, consisting of knights, priests and serving brothers, was organized into seven national Languages and commanded by a Grand Master elected for life. 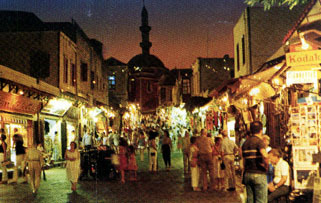 Nineteen Grand Masters reigned in Rhodes, 14 of the French Language . One of them, Pierre d' Aubussonm repulsed a siege by 70,000 Turks in 1480, a foretaste of the siege of 1522 by 200,000 men led by the Sultan Suleiman the Magnificent in person . After a heroic defense of six months by a mere 600 knights and some 1000 Italian mercenaries, the survivors were granted free passage to Crete and from there to their new home on Malta. Each Language was in charge of a section of the 25 m-wide walls . The three-km circuit of these mighty ramparts still affords the modern visitor the best view over the narrow lanes with their graceful arches and supporting buttresses which form bulwarks against the recurring earthquakes. Over the flat roofs rise the cupolas of the Byzantine and the spires of the Latin churches, as well as the slender minarets of numerous mosques, the whole framed by lovely gardens across the moat. The section where the knights once dwelt has been expertly restored. The splendid Inns of each Language line the Street of the Knights. The architecture is mainly Gothic, but modified by Mediterranean adaptations, such as the outside staircases . Behind the austere facade of the Hospice of the Knights, built between 1440 and 1489, opens a stately arcaded court from which the graceful refectory is entered . This is a worthy setting for the Archaeological Museum, which contains amongst other finds from all the Dodecanese two outstanding statues of Aphrodite. The Papal Palace of Avignon served Helion de Veilleneuve (1319-1346) as model for the grandiose Palace of the Grand Master, reconstructed by the last Italian governor in 1940 for the Italian royal family or, according to some, as a retreat for Mussolini. Outstanding within the walled city are the Castellania, the commercial courts of the Order of Saint John, the Byzantine Church of Aghios Georgios, the double-porticoed Mosque of Regib Pasha, the Mosque and Hammam of Sultan Suleiman. Though much enlarged by addition of a vast number of excelllent hotels and a casino, the New Town still bears the imprint of the Italians with their varied pseudo-styles, which produces a strange conglomeration of buildings on the waterfront. The New Market is perhaps the most pleasing, the Church of St. Francis is separated by the statue of a deer from the pseudo-Venetian Governor's Palace, Post Office and Bank are in the doubtful style favoured by Mussolini. The most restful landmark is the small Mosque of Murad Reis in a Moslem cemetery. Gaily flowered gardens stretch to the Aquarium, a striking building of rich material, though severely plain in style, on the island's extreme northern tip. The large glass tanks contain a varied section of maritime creatures.